What may seem unthinkable is now happening. Since 2004, international adoptions have collapsed by 81%, going from an incredible 22,989 to 4,200 budgeted adoptions in 2018 according to IAAME, the leading international adoption accrediting entity. That’s a staggering drop. Adoption isn’t cheap, as many people know. There are a lot of expenses that come with it. To some, it can be incredibly dizzying and nearly impossible. Still, families continue to find ways to be together despite green paper and metal coins. However, the regulations surrounding adoption continue to climb higher and higher, year after year. Not only are the adoption regulations becoming increasingly steep, the Office of Children’s Issues (OCI) refuses to work with adoption service providers (ASPs). What should be a peaceful collaboration to bring families together has turned into a hostile environment where OCI is placing more and more barriers around ASPs. With their reinterpretation of new practices and policies, international adoption is calculated to completely end by 2022. To fully understand, let’s go over a brief history. Congress in 2006 passed the Hague Convention on Protection of Children and Cooperation in Respect of Intercountry Adoption. This act was specifically created to make sure that intercountry adoptions remain in the best interests of the child. It was passed with the belief that it would help increase adoptions in America. That’s a terrifying statement. So what’s being said is that our very own State Department doesn’t want to deal with international adoption agencies because it would be too much of a hassle to handle all the monitoring that goes on? What about all the children and parents who are looking for their forever families? Without adoption, more children live in institutions and orphanages instead of a loving home. Children who aren’t in a family are in greater danger of homelessness, being trafficked, and suicide. You can help change this. Sign the petition now and make a difference. To learn more what you can do to save adoptions, visit Adoption.com. 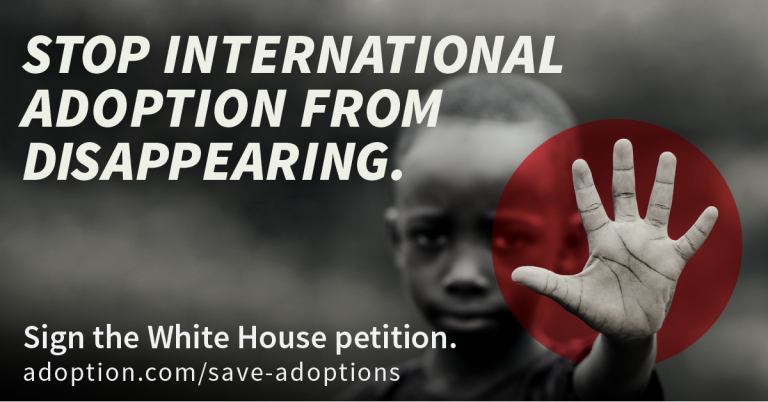 Read an additional resource on How to Solve the U.S. International Adoption Crisis.